During this meal I kept eagerly heading for each dish as soon as it hit the table only to have my companions cry, "Picture! Picture first!" It was so good that even as the official documentary photographer of our trip I kept forgetting to document in favor of jamming my gullet full of these treasures. 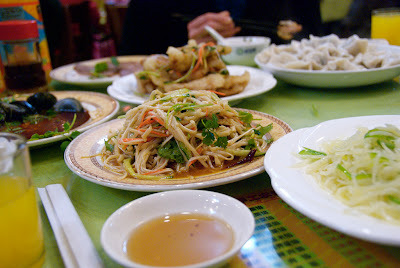 I have been telling people about this meal since the moment I landed back in the States from China. Finally I am getting to post the pictures and ask you to apply your expertise. You might want to go check them out on Flickr (links below) and view them large to get the details. The photo above is an egg dish. Hard boiled sort of eggs but they taste like bacon and eggs in your mouth all at once. I'm about to weep with the glory of the memory. Below is a vegetable. I know it looks like noodles, or when you get closer perhaps like very tall mushrooms, but I am assured (by Mr. Li and he wouldn't lead us astray) that they are a vegetable. They are slightly crunchy like a gently steamed sprout maybe. No amount of googling led me to a name. To sum up, my questions are two. 1. How do they make those eggs taste like that? 2. What is that veggie? Thank you for your assistance. Are those eggs perhaps pickled and aged in some way? I think they are but they don't taste like any kind of pickle I've ever eaten. They taste, no joke, like the perfect bite of bacon and eggs all mooshed together in your mouth. Also, a colleague told me that the bottom dish is actually mushrooms but crunchy mushrooms and I can get them in Chinatown. 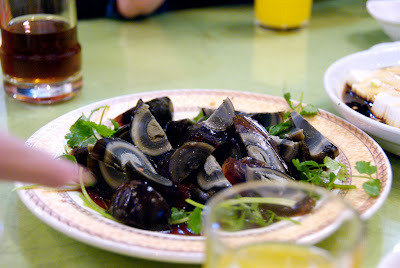 The Century Egg description says that the yolk smells like sulfur and/or ammonia and that wasn't the case with these. There were some other choices at the end of the article so I looked at those and I'm inclined to think it's a soy egg because the saltiness of the soy would account for the bacon I felt I tasted. I can't explain, though, why our eggs looked more purple than brown. Special spices? Food coloring?